Macadamia is the genus name and common name for various slow-growing tropical evergreen trees in the flowering plant family Proteacea, and in particular the commercially important Macadamia integrifolia and M. tetraphylla of Australia. The name also is used for the extremely hard-shelled, nearly round nut of these trees or the edible, round seeds contained in the nuts. Other common names for the fruit, in addition to macadamia and macadamia nut, include Queensland nut, Bush nut, Maroochi nut, and bauple nut. There are nine species in the Macadamia genus, with a disjunct distribution native to eastern Australia (seven species), New Caledonia (one species [M. neurophylla]), and Sulawesi in Indonesia (one species, M. hildebrandii). Although originating in Australia, M. integrefolia, with its smooth-shelled nuts, and M. tetraphylla, with its rough-shelled nuts, are now major commercial crops of Hawaii. Some of the nuts of other species of the genus do require processing to be edible. The exotic macadamia nuts, with their rich flavor, are used in a variety of dishes, whether raw or roasted, but are particularly common in desserts, such as cookies and candies. They are highly nutritious, and although high in fat, it is largely of the more healthy, monounsaturated form. The trees also are planted for ornamental purposes, and macademia nut oil is used as a skin care product. Even poor quality kernals can be ground and used as animal feed. While the hard nuts are not able to be consumed by many animals, cassowaries, and rodents are involved in seed dispersal and pet hyacinth macaws are often fed macadamias, since they can break the hard nuts with their strong beaks. Thus, these nuts, with their enclosed seeds, which are so vital to the plant's reproduction, also provide larger functions for humans and the ecosystem, and in turn are widely distributed. Proteaceae, the family to which Macadamia belongs, is a taxon of flowering plants in the order Proteales. Mainly restricted to the Southern Hemisphere, it is a fairly large family, with around 80 genera but fewer than 2000 species. Members of Macadamia are small to large evergreen trees growing to 2 to 12 meters (6 to 40 feet) tall. The leaves are arranged in whorls of three to six, land are anceolate to obovate or elliptical in shape, 6 to 30 centimeters (2.4-12 inches) long and 2 to 13 centimeters (0.8-5 inches) broad, with an entire or spiny-serrated margin. The flowers are produced in a long slender simple raceme, 5 to 30 centimeters (2-12 inches) long. The individual flowers are 10 to 15 millimeters (0.4-0.6 inches) long, white to pink or purple, with four tepals. The fruit is a very hard woody globose follicle with a pointed apex, containing one or two seeds. The tree was described and named by Baron Ferdinand von Mueller, the "father of Australian botany." The trees, which had long been known and used by the native Australian aborigines, had been discovered by British colonist in Queensland, Australia; in 1857, Walter Hill, Director of the Botany in Brisbane, used a vise to crack open one of the nuts, and planted the seed (with the tree still growing today). Baron von Mueller, who had been traveling with Hill, described the tree that year (1857) and named it after Scotsman John MacAdam, a friend, physician, and secretary of the Philosophical Institute of Australia, who died before ever tasting the nut that bears his name (Holmes 1994; Mueller 1857). Indigenous Australian names for the tree include gyndl, jindilli, and boombera. The macadamia tree is usually propagated by grafting, and does not begin to produce commercial quantities of nuts until it is 7 to 10 years old. However, once established, a tree may continue bearing for over 100 years. Macadamias prefer fertile, well-drained soils, a rainfall of 1,000 to 2,000 millimeters, and temperatures not falling below 10°C (although once established they can withstand light frosts), with an optimum temperature of 25°C. The roots are shallow and trees can be blown down in storms; they are also susceptible to Phytophthora root disease. The macadamia nut has an extremely hard shell, but can be cracked using a blunt instrument, such as a hammer or rock applied with some force to the nut sitting in a concave surface. In addition, a custom made macadamia nutcracker can be used. Nuts of the "Arkin Papershell" variety, crack open more readily. The nuts are a valuable food crop. Only two of the species, Macadamia integrifolia and Macadamia tetraphylla, are of commercial importance. The remainder of the genus possess poisonous and/or inedible nuts, such as M. whelanii and M. ternifolia; the toxicity is due to the presence of cyanogenic glycosides. These glycosides can be removed by prolonged leaching, a practice carried out by some Indigenous Australian people in order to use these species as well. The two species of edible macadamia readily hybridize, and M. tetraphylla is threatened in the wild due to this. Wild nut trees were originally found at Mount Bauple near Maryborough in southeast Queensland, Australia. Locals in this area still refer to them as "bauple nuts." The first commercial orchard of macadamia trees was planted in the early 1880s by Charles Staff at Rous Mill, 12 kilometers southeast of Lismore, New South Wales, consisting of M. tetraphylla (Power 1982). Besides the development of a small boutique industry in Australia during the late nineteenth and early twentieth century, macadamia was extensively planted as a commercial crop in Hawaii. The macademia was brought from Australia to Hawaii in 1881 or 1882 by William Herbert Purvis, who nurtured the seeds and planted them as seedlings in Kukuihaele, Hawaii (Holmes 1994). Over time, the world's largest manufacturer of macademia nuts became the Mauna Loa Macadamia Nut Corporation in Hawaii, which founded the plantation in 1948 and had the first crop in 1956, with the trees planted on rich, volcanic soil (Holmes 1994). The Hawaiian-produced macadamia established the nut internationally. However, macadamia production is now falling in Hawaii, with nut production dropping to a 26-year low in 2008 due to bad weather and pests. Outside of Hawaii and Australia, macadamia is also commercially produced in South Africa, Brazil, California, Costa Rica, Israel, Kenya, Bolivia, New Zealand, and Malawi. Australia is now the world's largest commercial producer—at approximately 40,000 metric tons of nut in shell per year, with a total global production of 100,000 metric tons. Macadamias are highly nutritious nuts. Although high in fat (73-80% is fat), this is largely the monounsaturated or "good" type of fat (80 percent of the fat is monounsaturated), making macademia nuts as acceptable as olive oil in one's diet (Holmes 1994; Bender and Bender 2005). Macadamias have the highest amount of beneficial monounsaturated fats of any nut. They also are a good source of iron, calcium, phosphorus, niacin, and vitamin B1 (thiamine), and protein (9 percent), and a source of carbohydrate (9 percent), dietary fiber (2 percent), potassium, sodium, selenium, and riboflavin (Holmes 1994; Bender and Bender 2005). Human nutrition research in Australia shows that macadamia nut lowers total and LDL cholesterol levels (Garg et al. 2003). Being hard-shelled, the macademia nut usually is sold shelled, whether roasted or raw, in jars or cans. They are used in a variety of dishes, and in particular are used for a diversity of desserts, including in cookies, candies, and other products. Kernels may be ground and processed to make macadamia nut oil. Macadamia oil is prized as a skin care product, containing approximately 22 percent of the Omega-7 palmitoleic acid (FRCNF 2008), which makes it a botanical alternative to mink oil, which contains approximately 17 percent. This relatively high content of "cushiony" palmitoleic acid plus macadamia's high oxidative stability, make it a desirable ingredient in cosmetics, especially skincare. Kernels that are not useful as food or for oil are often used as animal feed, while the shells and other waste products, such as a wood substitute in coffee roasting, organic waste for gardening, mulch for the trees, or chicken litter (Holmes 1994). The trees are also grown as ornamental plants in subtropical regions for their glossy foliage and attractive flowers. Macadamia nuts are often fed to Hyacinth Macaws in captivity (Csaky 2001). These large parrots are one of the few animals, aside from humans, capable of cracking and shelling the nut. On the other hand, one must be careful with the nuts or they byproducts around dogs, since macadamia nuts are toxic to dogs. Ingestion may result in macadamia nut toxicosis, which is marked by weakness with the inability to stand within 12 hours of ingestion. Recovery is usually within 48 hours (Hansen 2002). For thousands of years before European settlement, the aborigines ate the native nut that grew in rainforests of eastern Australia. One of these nuts was called gyndl or jindilli (Macadmaia integrifolia), which was later corrupted to kindal kindal by early Europeans. In New South Wales, the southern species is known traditionally as boombera (Macadamia tetraphylla) (MC). 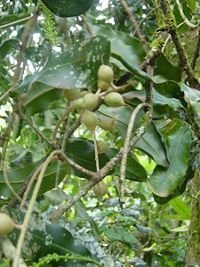 1828—Allan Cunningham is the first European to discover the macadamia plant. 1857—British botanist Ferdinand von Mueller gave the genus the scientific name Macadamia—named after von Mueller’s friend Dr.John MacAdam, a noted scientist and secretary to the Philosophical Institute of Australia. 1858—Walter Hill, Superintendent of the Brisbane Botanical Gardens, observes a boy eating the nut without ill effect, becoming the first non-indigenous person recorded to eat macadamia. 1860s—King Jacky, Aboriginal elder of the Logan River clan, south of Brisbane, Queensland, is the first known macadamia nut entrepreneur as he and his tribe regularly collect and trade the nuts with settlers. 1881—William H. Purvis introduces macadamia nuts to Hawaii as a windbreak for sugar cane. 1882—First commercial orchard of macadamia nuts planted at Rous Mill, 12 kilometers from Lismore, by Charles Staff. 1889—Joseph Maiden, Australian botanist, wrote "It is well worth extensive cultivation, for the nuts are always eagerly bought" (Maiden 1889). 1910—Hawaiian Agricultural Experiment Station encourages planting of macadamia on Hawaii's Kona coast, as a crop to supplement coffee production in the region (Rieger 2006). 1922—Ernst Van Tassel formed the Hawaiian Macadamia Nut Co in Hawai‘i. 1925—Tassel leases 75 acres on Round Top in Honolulu (Nut Ridge) and begins a macadamia nut orchard, Hawaii's first macadamia nut farm. 1931—Ernest Van Tassel establishes a macadamia nut processing factory on Puhukaina Street in Kakaako; nuts sold as Van's macadamia nuts. 1937—W.W. Jones and J.H. Beaumont reports in "Science" the first successful grafting of macadamia nuts, which paved the way for mass production. 1940s—Steve Angus, Murwillumbah, Australia, forms Macadamia Nuts Pty Ltd, doing small scale nut processing. 1964—Macadamia Nuts Pty Ltd opened Australia’s first purpose-built processing plant at Slacks Creek, near Brisbane, Queensland. 1997—Australia surpasses the United States as the major producer of macadamia nuts (Rieger 2006). 2001—Boo Yong Sia Estate planted 12,000 trees on 400 acres in the State of Johore, Malaysia. Csaky, K. 2001. The hyacinth macaw. Bluemacaws.org. From Parrots 46 (November 2001): 26-31. Retrieved October 8, 2008. Federal Research Centre for Nutrition and Food (FRCNF), Institute for Lipid Research. 2008. Seed oil fatty acids. German Centre for Information and Documentation in Agriculture (ZADI). Retrieved October 8, 2008. Garg, M. L., R. J. Blake, and R. B. H. Wills. 2003. Macadamia nut consumption lowers plasma total and LDL cholesterol levels in hypercholesterolemic men. Journal of Nutrition 133: 1060-1063. Retrieved October 8, 2008. Hansen, S. R. 2002. Macademia nut toxicosis in dogs. ASPCA. Reprinted with permission from the April 2002 issue of Veterinary Medicine. Retrieved October 8, 2008. Holmes, G. S. 1994. How is a macadamia nut made? In N. Schlager, How Products Are Made. Detroit, MI: Gale Research. ISBN 081038907X. IUCN. 2008. M. neurophylla. 2008 IUCN Red List of Threatened Species. Retrieved October 8, 2008. Macadamia Castle (MC). n.d. [History. Macadamia Castle. Retrieved October 8, 2008. Maiden, J. H. 1889. The Useful Native Plants of Australia. London, Trubner, Sydney: Turner and Henderson. Mueller, F. J. H. von. 1857. Account of some New Australian plants. Transactions of the Philosophical Institute of Victoria 2: 72. Power, J., 1982. Macadamia Power in a Nutshell. Hamilton, Australia: Macadamia Power Pty Ltd. ISBN 0959289208. Rieger, M., 2006. Introduction to Fruit Crops. New York: Food Products Press. ISBN 156022259X. This page was last modified on 17 October 2008, at 16:16.